Scharfes Mango-Pickle. Mangos hier einmal nicht zu Chutney verarbeitet sondern säuerlich als Pickle. Ideal zu Poppadums, Weißbrot, zum Fleischfondue, als Beilage beim Grillen. Ergibt vermischt mit Joghurt, Clotted Cream oder Crème fraîche auch einen leckeren Dip. 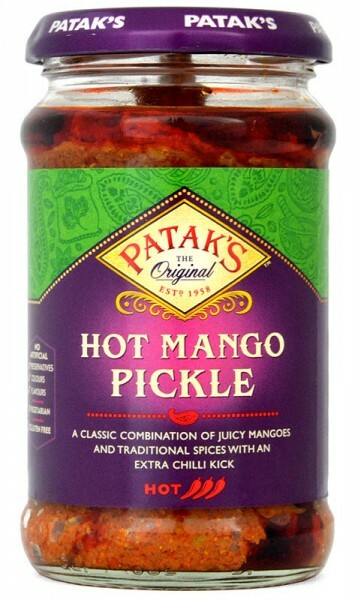 Hot Mango Pickle. Indian pickles are preparations of exotic fruits or vegetables cooked in preserving agents such as sugar, salt, oil and vinegar and finally blended with spices. They are savoury in taste and are traditionally served with Indian breads or as a main meal accompaniment. However, their uses outside of Indian food are limited only by your imagination. Try some with salads, cold meat or pizza. Ingredients: Mangoes (63%), Vegetable Oil, Salt, Chilli, Mustard, Fenugreek, Spices, Acetic Acid. Kundenbewertungen für "Patak´s Hot Mango Pickle"
Cadbury hat das Stricken für sich und für Sie wiederentdeckt. Enthält: Cadbury Curly Wurly Treatsize, Cadbury Fudge, Cadbury Chomp, Cadbury Freddo und ein Tütchen Cadbury Buttons.